Slots to play as a beginner: Part 2. Welcome back to another article in our online casino guide; Slots to Play as a Beginner. Last time we explored three slots suitable for the beginning spinner. Today we'll check out three new ones. We received cool suggestions for this edition, so let's hop right into it! Twin Spin by Net Entertainment. 5 reels, 243 ways to win, and at least 2 reels linked together with identical symbols. (96.6% RTP). 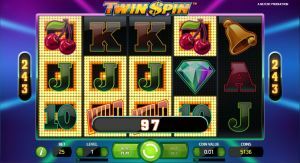 Open up the "most played" or "most popular" tab in the slot section of your casino, and you will find Twin Spin. Why? Well, I flunked my mindreading course, but one can imagine it's because of the following reasons: Twin Spin offers a max win of 270.000(!) coins, which is quite the potential, the slot isn't too complicated, just one feature (the linked reels), and it's appealing to the eye. In Twin Spin you have 243 ways to win. This means, if you have the same symbol from left to right, anywhere on the reels, you'll have a winning spin. There's only one (but very neat) feature, the linked reels. Each spin, 2 reels are linked, they spin together and have identical symbols in them. However, there is a chance that more reels join and link up, with a chance of up to 5 reels linking, and showing the same symbols! Dingding! Zeus III, by Williams Interactive (WMS). 6 reels, 192 paylines and a free spin feature. (96.10% RTP). Stepping up to a bit more advanced slot-territory, we'll find this beauty of a beast. The cone shaped slot is a nice variation to all the "square" slots. In the base game, 3 of the same symbols from left to right on a payline offer you a winning spin. If Zeus fills a reel, that reel will become a wild reel. 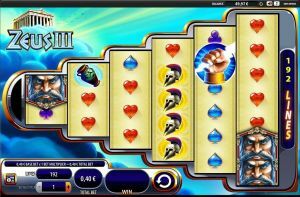 Three scatters (A fist holding a lightningbolt, shown in the picture above on reel 5) will grant you access to the free spins. In the free spins, the cone will turn around, to be mirrored vertically. This means that now the tallest reel is the first, giving the player more chances to make winning combinations. That's not all though, íf Zeus shows up on a reel, even as one symbol, he will expand himself and make the entire reel wild. 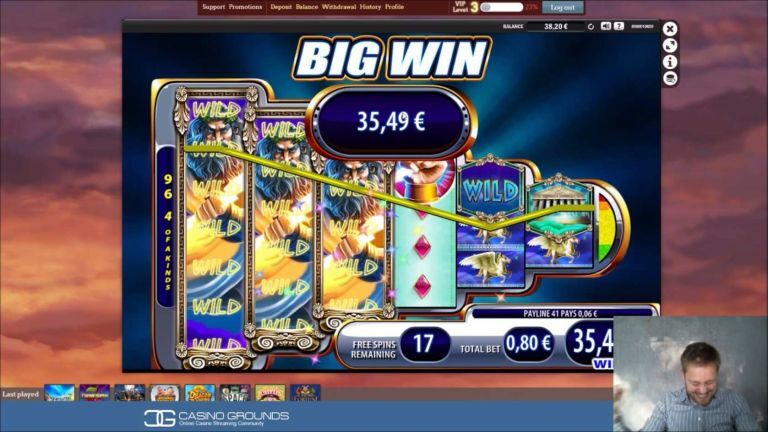 Needless to say, even though the base game has good potential, free spins in Zeus III will have you showing your ancles with your sunglasses on, leaving you in need of a cup of tea. Big Bad Wolf by Quickspin. 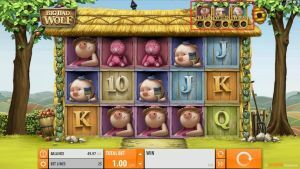 25 paylines on 5 reels, a free spins feature and a rolling reels feature where pigs go wild. (97.34% RTP). Never have I seen a slot double a balance as often as this one. Once Big Bad Wolf get's rolling.. oh baby! It works like this: 3+ of the same symbols on a line from left to right will brake the symbols. The symbols on top of that line fall down, and new symbols fill the slot. Each win fills a circle under the pigs (shown in the red square). If you win twice within one spin, the purple pig symbol becomes a wild. Win 4 times and the blue pig also turn into a wild. Six wins and the last pig, the green one, joins the party and goes wild. Each pig going wild makes it substantially easier to hit the next win. You can imagine that once they go wild, the potential to keep going is very real. And damn does that feel good! But wait, there's more! "Well Mike, tell us all about it!". There is a free-spins feature. Three "Wolf" symbols, the scatter in this game, on a payline from left to right, gets you 10 free spins. Here the wolf tries to blow down the house of each pig. Collect 3 "Moon" symbols, and you blow down the first, awarding you 2 extra free spins. Collect 6 moons in total, and the next house goes down, awarding you 2 more free spins, and a 2x multiplier for the rest of your spins. Big Bad Wolf has it all. High RTP and the chance for infinite wins gets your blood pumping, making it one of my favorite slots to play. This video will showcase you all the the video slots presented in this article for better understanding. That wraps up this edition. Thanks again for the suggestions and comments, they are very much appreciated. Enjoy the video of David playing the slots, and let us know which you would like to see next!